NEW G.I. STYLE 1QT. 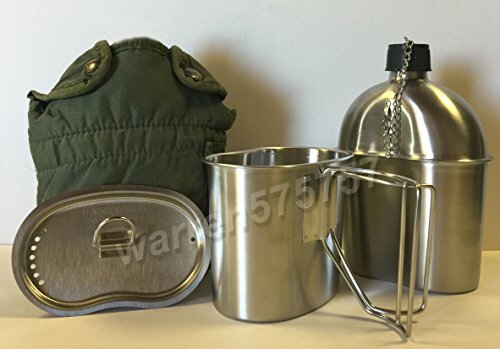 STAINLESS STEEL CANTEEN WITH BUTTERFLY HANDLE CUP (BRUSHED MATTE FINISH). And Stainless Steel Vented LID. MADE OF FOOD GRADE STEEL. IMPORTED. With Used Genuine Surplus G.I. Issue Nylon Olive Drab Canteen Cover. MADE IN U S. Some might have some spots, and some markings, but they are all functional good condition. While supply lasts. With Used Genuine Surplus G.I. Issue Nylon Olive Drab Canteen Cover. MADE IN U S. Some might have some spots, and some markings, but they are all functional good condition. If you have any questions about this product by G.A.K., contact us by completing and submitting the form below. If you are looking for a specif part number, please include it with your message.